The International Organisation for Standardisation (ISO) produces thousands of standards every year covering multiple topics and disciplines. A certain group of those standards known as management system standards are designed to support organisations in delivering products and services which are higher in quality, safer, more secure, more resilient, and environmentally friendly. Some organisations are required to implement these standards and some other to demonstrate their compliance to them. Within the industry there is a lot of “noise” about compliance, certification and accreditation, and the difference between these terms. So what do they actually indicate in reality? Any organisation can choose to implement a management system standard and use the standard to drive improvement and manage risk. They can choose to meet the requirements and perform internal audits as part of their overall management system. When an organisation implements such standards there are no mandatory requirements (demanded by the standards themselves) to undergo an external audit. Essentially any organisation can implement the standard and claim to be compliant. Customers of such organisations may ask that their suppliers meet certain standards and in some cases suppliers may simply state that they are compliant however some customers may go one step further and ask for evidence or choose to audit their supplier. For organisations with multiple customers, this could certainly be a large burden having to handle multiple customer audits through the year. This costs time, resources, and often coinage to produce the same evidence time after time. Certification to ISO standards for an organisation is simply a way of proving that an organisation does indeed comply with the relevant standard(s). It does not involve implementing extra requirements or controls, and if an organisation has already become truly compliant, certification should be a simple next step. Certification involves an audit being performed by an independent organisation known as a certification body. A certification body will usually perform an audit over two stages. A good certification body and their auditors will approach the audit from a positive perspective, attempting to find evidence of conformity and are not in the business looking to “catch people out” or to deceive people. In the event that non-conformities are found (by failing to fulfil requirements of the standard), then agreements can be made on how this will be addressed, which in some cases may need a re-visit and in others it may be acceptable to correct the non-conformity over a longer period of time. If an organisation meets the requirements and is recommended for certification, then the certification is awarded for a period of three years. During that time, the organisation must undergo annual surveillance audits. Surveillance audits are much smaller than the original audit and are designed to check whether the organisation is maintaining and improving its management system. How do we choose a good certification body? There are many factors to take into consideration but first we should describe an important matter. There are no rules or laws preventing anyone from setting up a company and calling it a “certification body” and awarding certificates. So how can we be sure that a certification that has been awarded by a “certification body” is credible and reliable? One response is accreditation. In order to demonstrate that their certification processes are fair, credible, and trustworthy certification bodies should follow a standard known as ISO 17201. ISO 17021 lays out how a certification body should operate in order to provide confidence in the certifications they award. When a certification body is compliant to ISO 17021 they can be audited and accredited by an accreditation authority. Most countries around the globe have a national accreditation authority (sometimes more than one) which accredits certification bodies. These bodies are all members of the International Accreditation Forum (IAF). So when selecting a certification body always check whether they are accredited by a member of the IAF. There are some “certification bodies” which are not accredited or are accredited by organisations which are not members of the IAF. This does not by default mean that their service is poor, however it is much harder to prove creditability without such recognition. 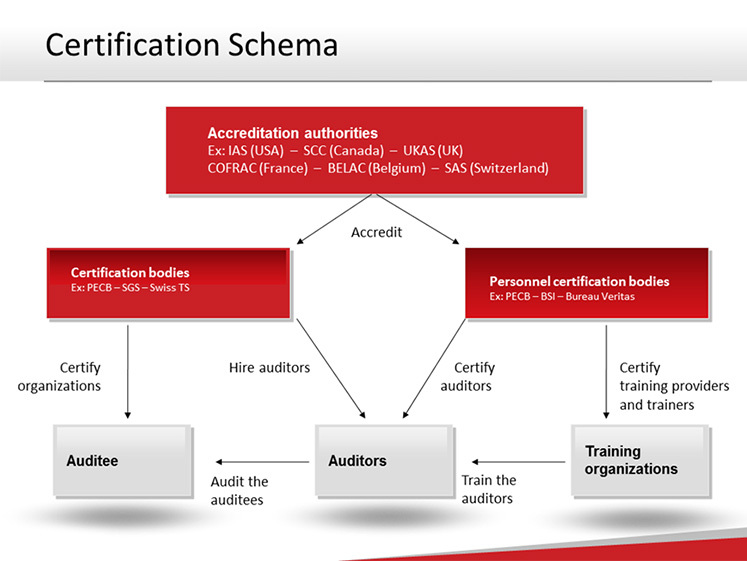 Does my certification body have to be accredited by the accreditation authority in my country? So as long as your certification body is accredited by a member of the IAF then this is the major point. Other factors in selecting a certification body would include, their credibility, their geographic presence, the price (of course) their knowledge of your industry and competence of their auditors. The latter is extremely important. Ensuring the audit team has the right skills, experience, and knowledge is fundamental to have a positive audit experience. That is why we at PECB, are continually involved in educating and certifying individuals and companies against ISO standards, as a way to show their commitment towards excellence, credibility, and international recognition. For more, please visit www.pecb.com.